Simple. Healthy. Tasty: How to get your Kids to Love Kale! How to get your Kids to Love Kale! It's getting to be that time of year again! I got some Kale starts from my Sister that my Dad put in pots and has been taking care of for me. I plan to plant in my new yard this weekend. (Yep it's the first thing going in even before the grass!) She lives in a warmer climate than I do and has had Kale for a while now. This is also her favorite way to use Kale so I'm bringing this recipe forward! Be sure to give it a try! Kale is amazingly healthy but, to most people, not too Tasty! It's pretty strong, a little bitter and kind of thick and chewy! Ryan and the kids claim to hate it but that's not entirely true. I love it because it grows well here and its just so good for you, I think everyone should have some on a regular basis! I don't mind the taste as much as the rest of the fam but you won't see me just eating a plain leaf very often. So when Ryan came home with 3 foot tall Kale from the farm guess what the kids said? After commenting on how huge it was Missy even came out with "Holy Kale!" Matt said, "I think we should make those into Kale chips!" It's their favorite way to eat Kale and made this way they will eat leaves and leaves at a time! I find it easier to throw them in a green smoothie but when we have excess Kale around making "chips" is the first thing we do with it. I love snacking on them too! And so does my 4 year old daughter Charly! Check her out! Of course I have the recipe for you! It's not too late you can get some Kale seeds and plant them today! Blend all ingredients until smooth in blender. Using a pastry brush “paint” both or one side (I do both sides) of a Kale or Collard leaf and set them on a nonstick sheet on your dehydrator. Dry them at 105 degrees for 6-12 hours, take off sheets, turn them over and dry for 2-4 hours more, until crispy. Robyn of GreenSmoothieGirl posted this recipe a few years ago on her blog, she had gotten it from a reader! It became an instant family favorite! Speaking of Robyn I went to another one of her classes last night! I recently read her book "The Green Smoothies Diet" and wanted her to sign it plus I love hearing her speak. She tells it like it is and I just love that! She does classes all over. If she comes to your area I highly recommend going to one, be sure to tell her Tammie@SimpleHealthyTasty sent you, she will know who you are talking about. She told me last night as I was getting the picture below with her, that I should start teaching some classes for her. Oh that could be so much fun! I've thought about maybe doing some local classes in the next few years. But I don't know if I'm ready to travel as much as Robyn does, I'm kind of love being at home! But maybe as the kids get older. I do love teaching classes and seeing the light come on as people start to understand true health principles! Robyn is doing such a wonderful thing it was so fun to be there and learn more from her! I also love reading her blog she is just such a good writer and inspires me on a regular basis! Thanks Robyn!!!! Oh by the way thanks so much to those of you who said hi to me at the class! It made my day! It's so fun to meet readers!!!! If you ever see me please don't hesitate to come say hi and introduce yourself. And if you have time I would love to hear "your story" too!!!! Unfortunately I don't have a dehydrator. 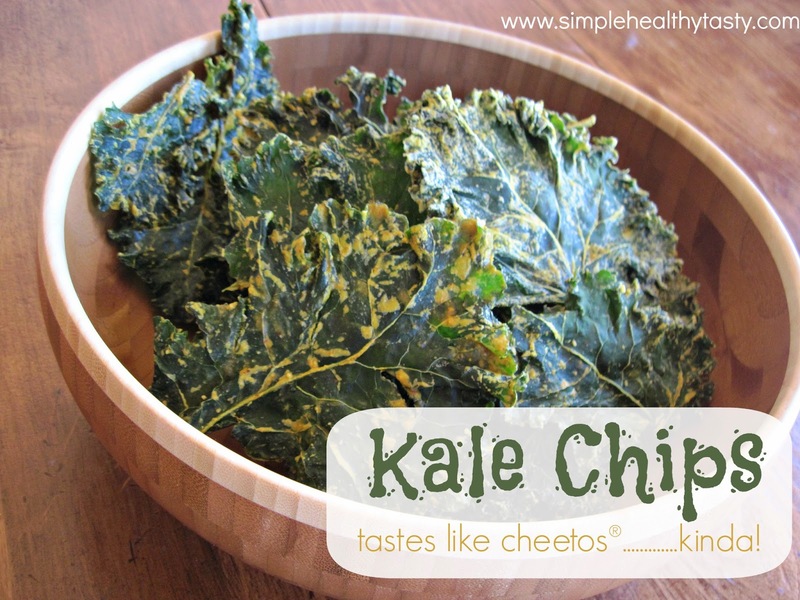 Would love to try kale chips. I will look for a recipe using the oven. Nolwenn: You could totally try these in the oven. If your oven has a setting lower then 120 that would be best for preserving the most enzymes. Those look really good. Your daughter is adorable! I have been thinking for a while about getting a dehydrator. What kind do you have and would you recommend it? Emily S.: I have the Excalibur 9 tray dehydrator. I love it! It's kind of known as the Cadillac of dehydrators. If you get one be sure it has a temperature gauge and I highly recommend one with a timer too! Hi Tammie! I said hi to you at the class last night. I told you about my daughter, Hazel. Thanks again for your blog and recipes. I love it all. I just got a dehydrator and can't wait to use it. It was so nice to meet you and chat for a minute. Those Kale chips look like an absolute work of art. I don't have any kids but heck i'm going to make them for myself! So I just bought some Kale chips from the market the other day...and we all munched 'em down. So handy you already came up with the recipe! I am so jealous that you got to meet Robyn. Hubby and I were just watching her bulk food video this morning. Well, I have tasted your kale chips and they are mighty tasty. I plan to make some soon. But Charly would have conviced me of their delicious-ness even if I had not ever tasted them. Give her a hug for Granny! Tammie, will once the recipe coat more than one leaf of kale the size Charly was eating? Do you just put the kale directly on your flex sheets in your dehydrator? Mom, yeah it should about 10 or more big leaves. And yep I just use the Teflex sheets (it makes the dehydrator less messy that way) then when the tops are dry and flip them over and take the teflex sheets off and let them dry until they are crunchy. Where do you get your kale seeds from? I have actually bought Kale starts from Sarah's Starts through Azure Standard then harvested the seeds off them. The seeds don't appear until the second year so don't pull the plant up in the fall. Or I'm pretty sure I've seen seeds at Wal-Mart. We planted a bunch of Kale and none of it came up at all! Does it need fertilizer or something? Our dirt is great as far as minerals, but it has almost no nitrogen, so I planted it in the dirt we "made" last year from dry leaves, grass clippings and goat manure. Last year's garden grew great in that dirt, but this year almost nothing came up yet. Do you know anything about what might be the problem? I will replant Kale if you think it will still come up. Diane: The weather has been so crazy this year so cold and WET. At least here. But I have noticed I have some Kale coming up where I let the one last year go to seed, I harvested some of the seeds but obviously some fell on the ground. There is bunches and bunches coming up. Maybe you just planted it too deep or something. I for would sure try again it should still come up and it grows FAST! My favorite is the Russian kind red or white. (Red is actually purple/green and white is green to me;)If you live close you are welcome to come get a start from all mine that are coming up cause it's going to get pulled like a weed. I tried this recipe last year and I love it. Only two of my four kids did though. I plan to make it again as soon as my plants are big enough since I have been craving it. But I want to say that it worked great for collard greens too. Kendra: I have found that if I rip a kale leaf into 1/4ths and take out the stem the kids that are afraid of green leaves are less intimidated by them also them I can just stick them in a bowl and pour the sauce over them and fit more in my dehydrator at once. It works great!